As far as we know, iTunes and Apple TV don't support MKV video files. When try to play MKV on Apple TV, iTunes will not even import MKV, let alone to stream MKV to Apple TV (or MKV to Apple TV 2 or MKV to Apple TV 3) by via of iTunes. The following article will introduce a simple and fast way to stream and play MKV on Apple TV, Apple TV 2 or the new Apple TV 3: Convert MKV to Apple TV as well as iTunes compatible video format to stream MKV to Apple TV from iTunes for playing MKV on ATV successfully. 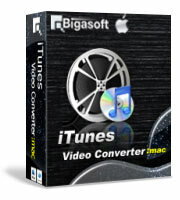 Bigasoft iTunes Video Converter is just right MKV to Apple TV Converter. It can fast convert MKV, HD MKV, 1080p MKV to a format that supported by both iTunes and Apple TV like MP4, MOV or M4V. Then it is just easy to sync the converted MKV from iTunes to Apple TV for playing MKV video on Apple TV successfully. Besides, this professional MKV to Apple TV Converter also seperately presets the optimized output conversion format for Apple TV, iPad, iPod and iPhone. Moreover, this powerful iTunes Video Converter also enables to convert other video formats including AVI, WMV, FLV, VOB, 3GP, WTV, MPG, MXF, MVI, AVCHD, WebM to iTunes compatible format for easy play in iTunes or sync to Apple TV/iPod/iPhone/iPad. The following will describe a detailed guide on how to convert MKV to Apple TV and iTunes compatible format so as to successfully stream MKV to Apple TV for easy play MKV on Apple TV, Apple TV 2 or the 3rd generation Apple TV. 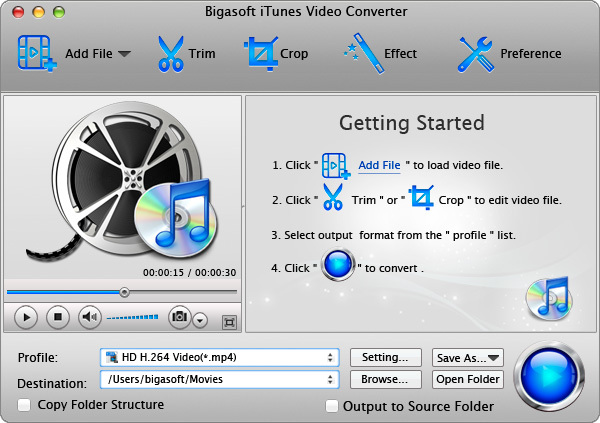 Free download the ideal MKV to Apple TV Converter - Bigasoft iTunes Video Converter (Mac Version, Windows Version), install and run it, the following interface will pop up. Click "Add File" button to import MKV video to Bigasoft iTunes Video Converter. This powerful MKV to Apple TV Conversion software also supports drag and drop function. Click the "Profile" drop-down button to select both iTunes and Apple TV supported "Apple TV MPEG4 Video (*.mp4)" from "Apple TV" Category. To play 720p MKV on Apple TV/Apple TV 2/the new Apple TV 3, select "Apple TV H.264 HD Video (*.mp4)" from "Apple TV" Category. To play 1080p MKV on the new 1080p Apple TV , select "Apple TV 3 H.264 1080p Video (*.mp4)" from "Apple TV" Category. Click "Convert" button to start converting MKV to Apple TV supported video format, it will be finished with high output video quality and fast conversion speed. After finishing converting MKV to Apple TV format, just stream MKV to Apple TV, Apple TV 2 or the new 1080p Apple TV by via of iTunes. Then it is just easy to play MKV on Apple TV successfully. The software in the above step-by-step guide also helps to convert and stream MKV, 1080p HD MKV to iPad, iPhone or iPod. Wait no more, just free download the ideal MKV to Apple TV Converter to convert, stream and play MKV on ATV/iPod/iPhone/iPad/itunes with ease.